February 14, 2018 by Laurie Leave a Comment This post may contain affiliate links, which means if you click on a link and purchase something, I may earn a small commission (at no additional cost to you.) See my disclosure policy HERE. Oh my stars, how cute is this?? 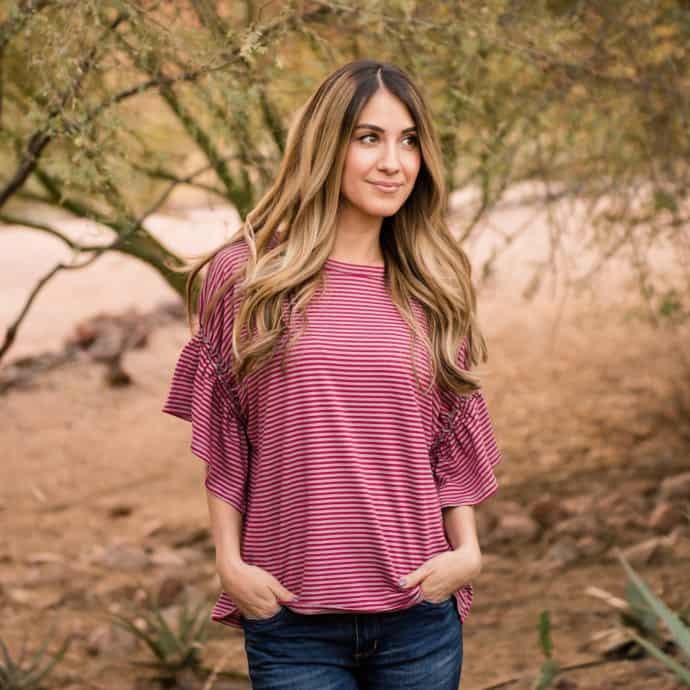 Jane.com has this adorable ruffle sleeve top on sale today for just $19.99! This is regularly $39.99! Few things are sweeter than ruffles! This new beauty has adorable gathered ruffle sleeves and a comfortable stretch material! Pairs well with your fav jeans for a casual look or can easily be made up with a skirt for a fancier occasion! Has a looser fit so we suggest sizing down if you’re between sizes. Model is wearing a small.